Two recent incidents, a pedestrian was struck by a tram, and a tram running a red light, highlight the need for safety upgrades to Canberra's light rail network, before it goes into regular service. Better markings and low level lights for pedestrian crossings, plus activation of Automatic Train Protection (ATP), would make the network safer. These have been suggested to Transport Canberra, and Meegan Fitzharris MLA, ACT Minister for Transport. These measures would save money, by avoiding accidents. Otherwise those who decided to not to install safety measures may need to explain their actions in the ACT Coroner's Court, if there is a fatality. In a recent incident, a pedestrian was struck by a test tram. When using the tram crossing near the station at the intersections of Northbound Avenue and Macarthur Avenue, I noticed the crossing was difficult to see, as were the indicator lights. The crossing is the same gray concrete as the path leading up to it, with no contrasting color to mark where to stop, or where the crossing is. There are Hazard Tactile Indicators to warn those with low vision, but these are also in a low contrast color, and difficult to distinguish from the concrete. The pedestrian indicator lights are high up on poles. It is therefore very easy to step out into the path of a tram. On the day I used the crossing there was a laminated paper sign attached to the poles near the indicator lights. This sign warned to look out for trams. However, the sign was flapping in the wind, hard to read, and was distracting from the indicator light, so increasing the risk of an accident. The tram crossings should, I suggest, be marked in a contrasting color, as the adjacent road crossings are, and lower lights added. 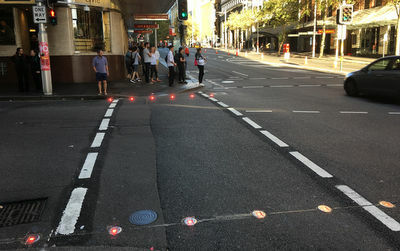 Low level lights are being trialed in Sydney and Melbourne. In a recent incident reported in the media, a test tram ran through a red light. This indicates that Canberra's trams are either not equipped with Automatic Train Protection (ATP), or it is not functioning correctly. With ATP the tram would stop automatically at a red light, preventing accidents. ATP should be fitted and functioning before the system is put into service. Canberra is full of otherwise intelligent people, but they do not stop at tram crossings. I suggest fences are needed along the track, and at stops, as well as better marking, and signals, at crossings. Yesterday I waited fifteen minutes for a bus on Northborne Avenue (while trams rattled past empty). In that time I saw several people use the crossing adjacent to the MacArthur Avenue tram stop. None of these people even paused as they approached the crossing, they did not look left or right, just walked strait across the tracks. The same people did stop, and look, at the road crossings. Several people also walked across the tracks not at the crossing. It would be easy to say these people deserve their fate, but we need to build infrastructure for people as they are, not as we would wish them to be. Canberra has just one short line, and a few stations. It should not be that difficult to program the trams not to run through stop lights. TC have not responded concerning the need for better pedestrian marking, signals, and fencing. "Hi Tom, thanks for contacting us. Automatic Train Protection is a range of different signalling technologies that have been adopted to varying degrees across train networks in recent times. Only small parts of the Australian train network currently operate ATP. It is based upon (train) railway signalling systems that are utilised on train networks but not light rail/tram networks. There has been no adoption to date of ATP in light rail/tram networks. Once the ATP technology is developed for light rail/tram systems it is expected most operators across the world will examine whether it is suitable and required for their networks." Transport Canberra, thanks for replying to some of my concerns over the safety of Canberra light rail. The level of Automatic Train Protection (ATP) I had assumed would be in place, was to at least automatically stop a tram at stop signals. The European members of the consortium building the Canberra system have extensive experience of ATP on large complex networks, and offer the same model trams as Canberra has, already fitted with ATP. It would therefore be relatively simple, and inexpensive, for them to fit the small simple Canberra line with at least a minimal level of ATP. In my view it is not safe for you to place this system in operation without ATP, and the other measures to improve pedestrian safety, which I have pointed out.